Bill 'Smokewagon Bill' Hoover prepares for his turn at shooting during a cowboy action shoot at Stuckenhoff's Sport Shooting complex last Sunday in Casper. Photo by DAN CEPEDA, Star-Tribune. A custom-made six-shooter in the holster of Kim 'Wild Iris' Harter before competition. Photo by DAN CEPEDA, Star-Tribune. Roy 'Wyoming Roy' Mathis competes with a Winchester reproduction with the Bessemer Vigilance Committee. Photo by DAN CEPEDA, Star-Tribune. The piano player bangs out a tune in the corner of the smoky saloon as the last cards are drawn. The red-headed stranger turns over a full house and reaches to collect his chips. "Nobody's that lucky, Mister," you say. The music stops as the stranger stands, his spurs jingling on the hard wooden floor. "You callin' me a cheater?" he says, his hands on his pistol belt. You cooly shuffle the deck and cut the cards. If it's a black card, you'll draw your Colt revolvers on the no-good skunk and shoot him down like the mangy scoundrel he is. If you draw red, you'll fill him full of lead with your Winchester rifle. It's the Ace of Diamonds. You reach for your rifle, pull back the hammer and blast the good-for-nothin' cheatin' saddlebum down. His desperado buddies draw their guns on you, but you mow them down with your pistols. You start making your way to the exit but not before picking up your double-barrelled shotgun to blast the bushwhackers that are standing between you and the door. Or, wait a minute, were you supposed to use the pistols on the bushwhackers at the door and the shotgun on his desperado buddies? Oops, that's a 10-second procedural penalty. So it goes in the wild sport of cowboy action shooting, the hobby of the Bessemer Vigilance Committee, a group of Old West enthusiasts who shoot live ammunition at make-believe bad-guy targets in competitions held the first Sunday of every month at Stuckenhoff's Sport Shooting Complex in Casper. The Bessemer Vigilance Committee, named for the vanished ghost town on the outskirts of Casper, is one of eight cowboy action shooting clubs in Wyoming, a state that has about 300 cowboy action shooters. The club's matches are sanctioned by the Single Action Shooting Society, SASS, which has tens of thousands of members across North America, Europe, Australia and New Zealand. The shooters can use only pistols, rifles and shotguns that are single-action, which requires pulling back the hammer to fire each round. Only firearms like those used on the American Frontier in the late 1800s can be used in competitions. While blasting targets with vintage replica guns is the main attraction of a cowboy action shoot-em-up, getting gussied up in Old West costumes and making up your own nickname is cool too, said a dusty gunslinger from Riverton who goes by the name of "Upton O'Good." "We put on our costumes and leave our real identities at home. A lot of the shooters don't know each other than by their aliases. It's really a bunch of adults, or people who call themselves adults, playing." A typical cowboy action shooting match has a number of stations each with a different Old West scenario of targets to plink at in a certain order with the timer running. The shooters go one at a time at each stage and the best time wins. Last Sunday's scenarios included a poker game gone bad, a farmhouse assault by a gang led by a bad guy named Slick Willy, and a raid on the Bessemer Jailhouse wagon. In any given match you could fight off cattle rustlers, bank robbers, and almost anything you can imagine from a western movie. The targets aren't too hard to hit, depending on how fast you want to shoot. The tricky part is that you must hit the targets in a specific order or you'll get a 10-second procedural penalty. Every miss is a five-second penalty. Although the matches are judged on time, it's not a quick-draw competition. Accuracy is more important. "We're very safety conscious," said "Eaton Flowers," the club's president, who in real life goes by the name Tom Michel. "Every shoot begins with a safety meeting and if you miss the meeting you don't get to shoot." Shooters can compete in several categories, depending on how they like to shoot: two-handed, duelist or the tricky but popular gunfighter style, which is alternating shots between two revolvers. Some shoot only self-loaded black powder cartridges, while others only use cap-and-ball firearms. Most competitors use modern replicas of the old .45 Colt revolver, 1873 Winchester rifle and .12 gauge double-barreled shotgun. One thickly mustached stranger who rolled through town for Sunday's shoot was "Jasper Agate," a Nevada native and traveling cowboy action shooter. His wife is a traveling nurse so they spend a short time in an area before they mosey on to the next town. "We pick the spot we're going to by the cowboy shooting," he said. "We've shot all the way from New Hampshire to northern California and southern California to Tuscon, all kinds of wonderful places." 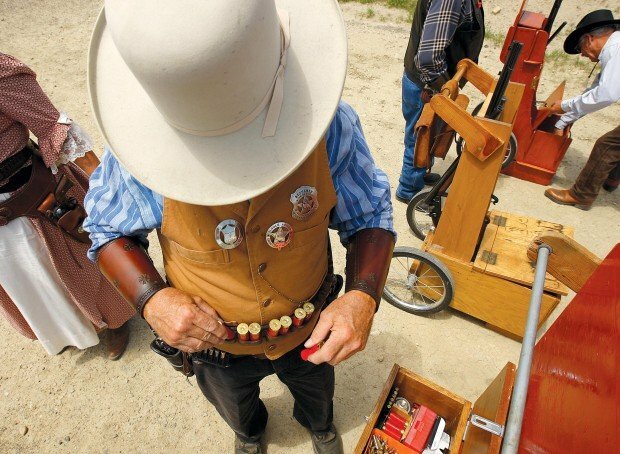 Casper gunslinger "Smokewagon Bill," the club's vice president who's also known as Bill Hoover, said the fantasy gunfighting competition is a way to travel down memory lane to the good old days of westerns on TV and at the movies. "We're old timers who grew up watching Roy Rogers and Hopalong Cassidy. It gives us a chance to play cowboy." "Two-Dot Lady," "Morning Glory" and "Wild Iris" are a few of the club's pistol-packin' ladies who give the guys a run for their money at every shoot. "I enjoy the competition. I love the clothes. 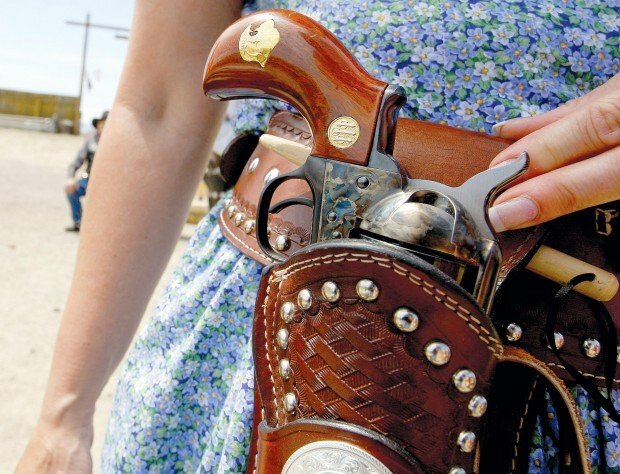 We have a lot of fun doing what the guys like to do," said Two-Dot Lady of Casper, sporting a pair of Ruger revolvers on the hips of her flower-patterned ladies day dress. "This is something you'd wear into town to go shopping. I'm going for a gunfight today." Morning Glory, a gunfighter from Sybille Canyon, is one of the top female shooters north, south, east and west of the Pecos. She was the 2006 SASS Ladies Indoor World Champion. To her dressing up is OK, but she shoots to win and to share some laughs. "Once you get going with it, it's kind of addictive. I'm a competitive person so I like the competition, but I also like the comradery. You get to know all these people. I probably know all about all their families but I don't know their real names. I just know their aliases." Wild Iris is a lady gunfighter from Casper who's invested some extra time and money into her Old West look. Her outfit of a blue flower dress, cotton petticoat and bonnet is accentuated with a shiny broach and a specially made ladies gun belt. The bird's head grips of her two Beretta .38-Special revolvers are adorned with real Buffalo nickels. Most of the money people spend on the hobby goes into buying ammo and reloading supplies. They each shoot close to 100 rounds at every competition. Or, as "Ira B. Halffast" of Lander says: "Basically what we do here is turn money into smoke." You gonna pull them pistols or whistle 'Dixie'? Come shoot with the Bessemer Vigilance Committee or just sit back and watch the show. The gunslingers compete the first Sunday of every month at the Cowboy Shooter's Range at the Stuckenhoff Sport Shooting Complex in Casper. To participate, register before the mandatory safety meeting that begins at 10:45 a.m. In a typical match, shooters vie for the quickest times shooting targets at four Old West themed stages. Club memberships are $35 for singles, $50 for couples. You don't have to be a member to participate (but it helps to know your western movie quotes). To learn more about the club, call Eaton Flowers, aka Tom Michel, at 235-1535, or Smokewagon Bill, aka Bill Hoover, at 472-1926. * Seventh Annual Lawdogs vs. Cowboys Shoot, June 22. The Bessemer Vigilance Committee takes on local police officers in a cowboy action shooting competition for charity. * Jailbreak 2008, July 25-27. A 10-stage match and three-stage Wild Bunch match at Stuckenhoff's with awards for the top shooters, prizes for the top gent and lady, and costume awards. Other Wyoming cowboy action shooting clubs are in Buffalo, Cheyenne, Cody, Gillette, Lander, Powell and Wheatland.